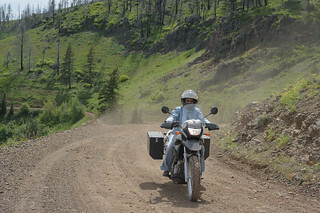 Jessica and I talked a few months earlier about joining Pacific Northwest adventure riders in Enterprise, Oregon near Hells Canyon for the fourth annual weekend of riding and camaraderie organized by Sherry, ADVrider “Ladybug.” But somehow the plan didn’t make its way onto our ride calendar. When we realized it was the next week, we scrambled to arrange time off from work and babysitting for our two-year-old. We weren’t positive we’d be able to go until nearly the day of departure. Planning the adventure was itself an adventure! 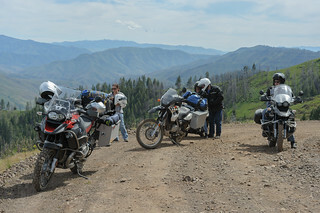 The last time we rode to Hells Canyon, we learned a couple routes not to take.¹ The motorcycle still bears the scars. 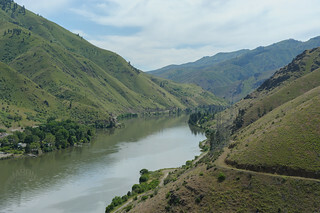 But we wanted to avoid the long freeway from Boise so I asked the map software to plot a route through Hells Canyon again. A few people were posting road reports into the ride discussion² and I quickly realized we might have a problem. 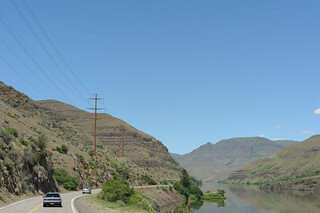 One person suggested⁴ that Hess Road, seven miles of gravel switchback up the side of the canyon past Oxbow Dam, should bypass the closed sections of the loop road. We didn’t know its condition, or even if it would get us where we wanted to go, but we decided to roll the dice. 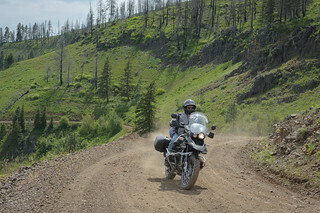 It is a beautiful day to ride through Emmett and down Highway 52 along the Payette River. 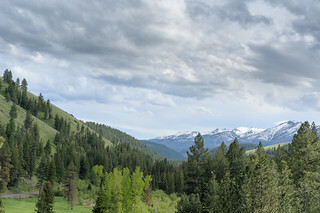 The valley is sprinkled with wildflowers, lush with spring grasses. Stands of trees along the river give shade to weathered homes and lazy animals. Where the road veers closer to the edge of the valley, I see the green end abruptly at a rising desert cliff pock marked by avian ambitions. The dramatic contrast between verdant and arid, horizontal and vertical, is momentarily mesmerizing. 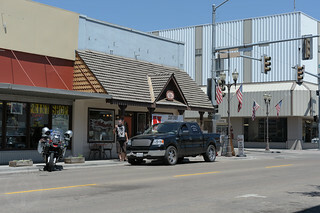 After a light breakfast at home, we planned to stop for brunch in Weiser. As before,¹ we ride in circles past vacant brick buildings, searching in vain for a restaurant we’d like. Or any restaurant. Last time we gave up and had Chinese. Jessica said we couldn’t go there again. So we search again, visors up, yelling opinions. We end up having pizza. I feel sorry for myself after anticipating hash browns and much needed coffee so we ride a short ways to a candy shop we saw earlier to coat our sorrows with sugar. As we’re parking we notice a little coffee parlor across the street. Even better! 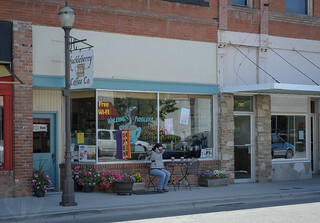 We order lattes and sit outside in the shade, watching the quiet main street. A kid on a bicycle pulls up next to our motorcycle then backs in at the same angle. Nice. Clouds of bugs fly suicide sorties against my visor as we ride the highway up to Cambridge. I am respectfully removing their small carcasses with a squeegee at the corner gas station when I see three GS motorcycles parked at the café across the street. Other folks heading to Enterprise, I surmise, so we blip across to say hello. It turns out they aren’t part of our group and haven’t even heard of ADVrider! 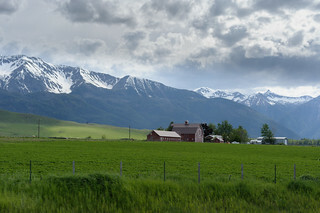 They are two brothers on their way with their wives to Joseph, Oregon from Coeur d’Alene, expecting to take the section of Wallowa Loop Road that we learned is closed. I give them the bad news. Then I give them good news: we have an alternative! I caution that we aren’t sure it will work and have no plan B. They talk among themselves a moment and decide to join us. 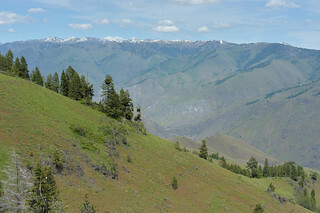 We lead the way along the twisty and scenic Highway 71 down to Brownlee Reservoir in Hells Canyon, then up to Oxbow. We stop in the shade of Copperfield Park along the river for a break before transitioning to gravel. It is considerably warmer in the canyon and our speed from here onward will be considerably slower. We snack and shed liners. Coming to what the GPS and minuscule road sign says is Hess, we hesitate to survey the road upward. It is rougher than what we’ve been on. 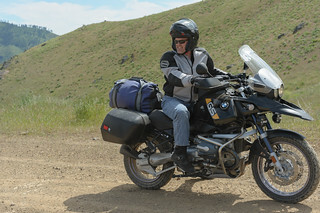 “I’ve never ridden anything like that,” advises Cheryl, who is on her own 650GS. 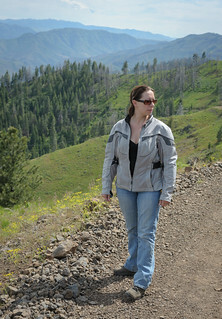 Jess and I set the pace in first gear, slowly climbing the road, dodging occasional baseball-sized rocks, steering around minor ruts left from the rains and keeping a close eye on the others in the mirror. We pause where the road approaches level. Nobody is having any trouble. Trees and flowers replace rocks and dry grasses, urging us onward as we gain altitude. 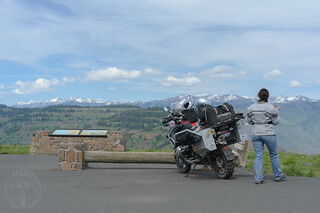 We stop to admire the view and let the bikes cool as we near the top. The brothers work on disabling Cheryl’s anti-lock brake system. Three presses and you get a red light? Or was it two presses, a green light and then the red light? 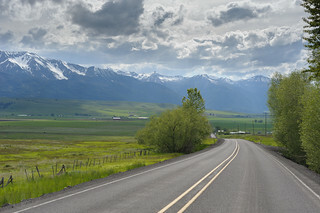 There is relief when we finally reach Wallowa Loop Road — relief that everyone made it up Hess without mishap and relief that it does indeed connect to the loop road. 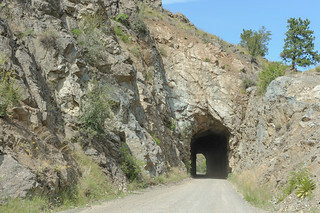 We anticipate easy riding from here. 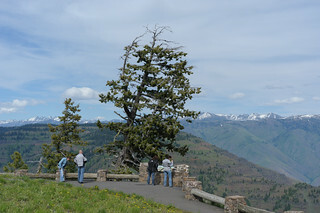 I had planned to ascend Hess and visit the Hells Canyon Overlook last fall when we came this way¹ only to be turned back by rain and snow. 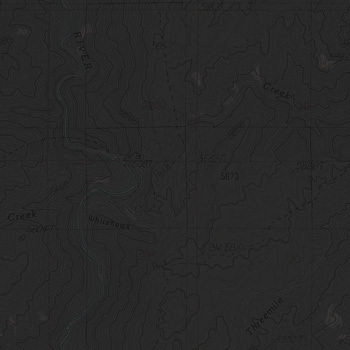 The overlook is still marked in the GPS, just a few miles from here. 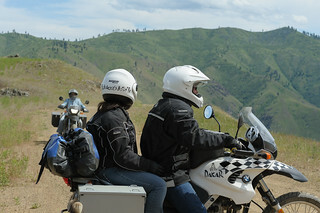 Our Coeur d’Alene friends opt to join us for the small detour. 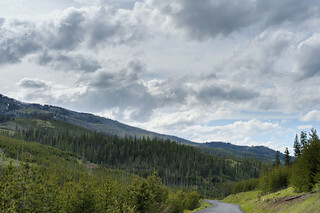 After a spirited ride up the short, tree-lined access road, we come into the parking lot and pull up to a couple reclined on a bench, bottles in hand, drinking in the view. 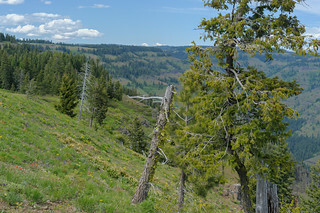 We join them in looking out across yellow and red wildflowers, through green needles and across the sun-burnt canyon to the white Seven Devils on the horizon. 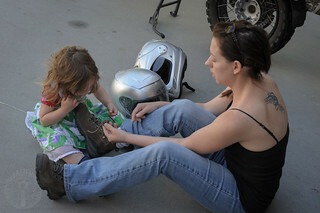 “Rowdy motorcyclers,” the couple complains with a smile. We share information about the roads we’ve arrived on. The couple tells us the remaining loop road to Joseph is open. We’ll have no problem continuing that way. In turn, we tell them they can drive Hess Road in their Subaru. Piece of cake. From the overlook, we part company with the others. Although travelling the same direction for a bit longer, we’ll set our own pace, stopping or speeding as the spirit moves. We say our goodbyes. 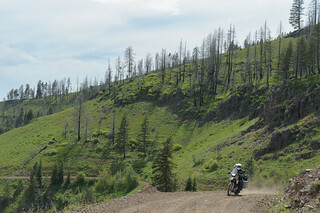 Wallowa Loop Road is an ideal ride. 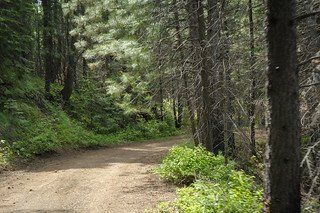 Narrow but paved, the road winds past creeks through forest and mountains in crisp air filled with the fresh scents of moss and pine. Mountains grow taller, forest becomes prairie and roads uncoil as we grow closer to Joseph. Jessica and I are ready to stake out a spot, set up our tent and take it easy the rest of the day. We’ll have time for more adventures tomorrow.